Gillingham ended a run of three successive defeats. 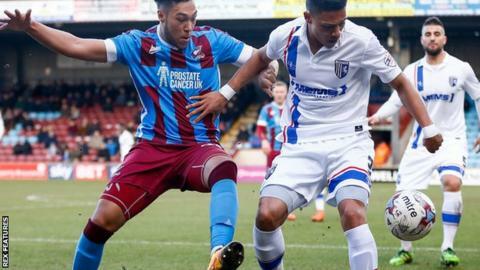 League One high-flyers Gillingham were lucky to escape with a point in a one-sided draw at Scunthorpe. The home side dominated from start to finish, but could not find their finishing touch as Paddy Madden wasted a number of opportunities. He was twice denied in the first half by a full stretch Stuart Nelson, and he also crashed a header against the bar. Nelson thwarted Madden again in the second half, and also kept out Conor Townsend and Kyle Wootton. Scunthorpe sit 15th in the League One table after the result, eight points behind sixth-placed Barnsley in the play-off spots. Although they had little attacking edge, Gillingham climb to third, five points behind second-placed Wigan and an automatic promotion place. "We were dominant from start to finish, perhaps apart from the last six minutes when they managed the game well. We gave away a few sloppy free-kicks but we're really pleased with the performance. "We restricted them to one shot on target and we had 13 attempts on target if you account the two blocks and the two that hit the woodwork. Another frustrating afternoon but I can't ask any more from the lads in terms of everything until we put the ball in the net. "The keeper has pulled off three really good saves, we've hit the woodwork, we've not got the bounce of the ball and our finishing has been wasteful. If our finishing is wasteful then the most I can ask is we don't lose the game." Match ends, Scunthorpe United 0, Gillingham 0. Second Half ends, Scunthorpe United 0, Gillingham 0. Corner, Gillingham. Conceded by Jordan Clarke. Jamie Ness (Scunthorpe United) is shown the yellow card for a bad foul. Brennan Dickenson (Gillingham) wins a free kick in the attacking half. Dominic Vose (Scunthorpe United) wins a free kick in the attacking half. Substitution, Scunthorpe United. Dominic Vose replaces Jim O'Brien. Attempt saved. Paddy Madden (Scunthorpe United) right footed shot from outside the box is saved in the bottom left corner. Attempt missed. Doug Loft (Gillingham) left footed shot from outside the box is close, but misses to the right. Corner, Scunthorpe United. Conceded by Max Ehmer. Substitution, Scunthorpe United. Gary McSheffrey replaces Stephen Dawson. Attempt saved. Kyle Wootton (Scunthorpe United) header from the centre of the box is saved in the top centre of the goal. Substitution, Gillingham. Bradley Garmston replaces Dominic Samuel. Attempt missed. Paddy Madden (Scunthorpe United) right footed shot from the centre of the box is close, but misses to the left. Corner, Scunthorpe United. Conceded by Dominic Samuel. Conor Townsend (Scunthorpe United) wins a free kick on the right wing. Corner, Scunthorpe United. Conceded by Stuart Nelson. Corner, Scunthorpe United. Conceded by Rory Donnelly. Substitution, Gillingham. Rory Donnelly replaces Luke Norris. Attempt saved. Paddy Madden (Scunthorpe United) right footed shot from the right side of the box is saved in the bottom right corner. Attempt saved. David Mirfin (Scunthorpe United) header from the centre of the box is saved in the centre of the goal. Corner, Scunthorpe United. Conceded by Jermaine McGlashan. Corner, Scunthorpe United. Conceded by Jake Hessenthaler. (Scunthorpe United) wins a free kick in the defensive half.